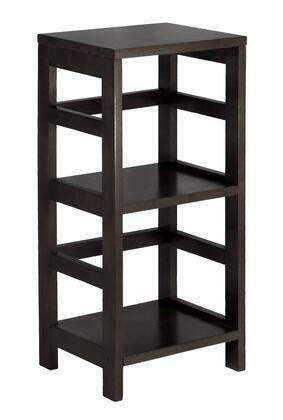 With its classic, sturdy design, this elegant shelving unit fulfills both style and functionality requirements. Its two sections holds the Espresso Small Storage Basket perfectly and can be used to store books, toys, magazines, and any other accessories you may want to hide away. Easily mix and match with the other Espresso Storage Shelves for additional storage. This shelf assembled dimension is 13.3"W x 11.2"D x 29.2"H and the two inner shelves are 11.8"W x 11.1"D x 12"H with a static weight of 20 lbs per shelf. Made from combination of solid and composite wood in an espresso finish. Assembly required. 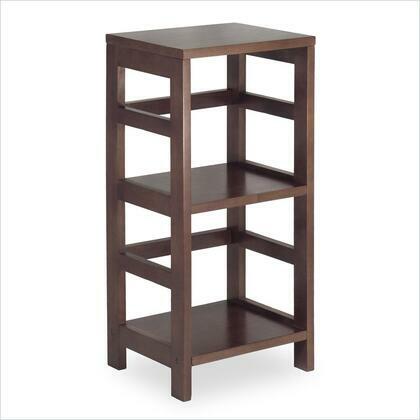 Open flow desined 2-Section shelf assembled size is 13.3"W x 11.2"D x 29.2"H. Shelf clearance is 12". Made from combination of solid and composite wood in espresso. Assembly required.